So why turkey then? Why is it the bird of choice for Christmas dinner? Its now 21:00 Christmas Day, and we’ve just started on the turkey sandwiches after having turkey dinner too, that’s an awful lot of turkey for anyone. So am I complaining… yes, but mostly because I enjoy complaining, but lets wait a minute and spare a moment for those poor turkeys. They spend all year thinking life is good, being fed lots of food and not a care in the world, and then suddenly the tinsel goes up and the axe comes down, Merry Christmas. So, perhaps one day next year you’ll give the turkey’s a break… and have chicken instead! 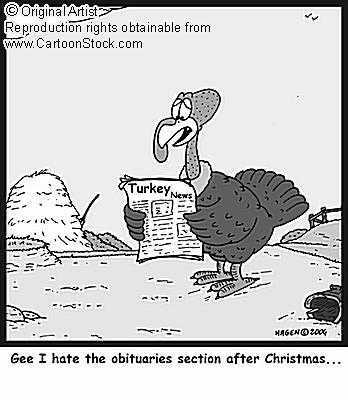 www.santas.net – Turkey was imported to the UK in the 1520’s. www.britishturkey.co.uk – 90% of UK families serve turkey at Christmas.